After reading TSIAs, “The State of Customer Success 2019,” by Phil Nanus, it was clear to me that Customer Success continues to grow at an unsurprising rate. Like any function with rapid growth, there are many business challenges and unanswered questions around this discipline that is quickly becoming recognized as an organization of its own. Phil touches on an array of interesting trends. However, in this post, I will highlight three that resonated with me based on my experience and what we are seeing in Customer Success organizations that we serve. Trend #1: Customer Success organizations are monetizing their programs. Funding for Customer Success is still unclear across the industry, though those that do have a funding model have increased revenue responsibility. This is often accomplished through monetizing Customer Success either through the core offering or as an offering on its own. To ensure growth and longevity of your Customer Success organization it is important to understand how it is going to be funded, what revenue responsibility it will carry, and how it can be monetized. *Research shows that customers are willing to pay for monetized Customer Success services. At Ecosystems, we are seeing an increase in monetized Customer Success offerings. That said, it is still not the norm across organizations that we serve. As Customer Success continues to grow across the technology industry, organizations may look to not only monetize some of their Customer Success offerings but will also look to outsource them to companies like Ecosystems, a third-party expert in value and business outcomes. 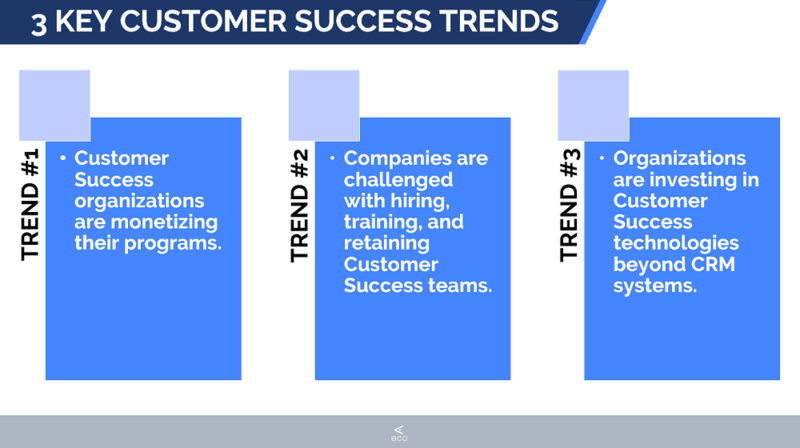 Trend #2: Companies are challenged with hiring, training, and retaining Customer Success teams. Staffing a Customer Success program is also very challenging. Not only is it difficult to find candidates with the right blend of skills, but they are also at an extremely high demand. With high attrition rates, even after the right candidates are hired and trained, retention is difficult. There are far more Customer Success job openings than there are candidates. Salaries continue to increase which contributes to the difficulty in scaling. Difficulty in acquiring top talent, along with the cost of attrition will be another leading factor in companies looking at outsourcing some or all of their Customer Success offering. Trend #3: Organizations are investing in Customer Success technologies beyond CRM systems. Finally, Phil touches on Customer Success Technology. While Customer Success organizations have historically used their sales Customer Relationship Management (CRM) system for managing their existing customer base and the Customer Success activities, there is a significant increase in organizations investing technology specifically for the Customer Success teams. These technologies not only help to scale Customer Success activities as well as correlate those activities to some sort of a customer health score. At Ecosystems, we believe our clients must be co-creating, collaborating, and validating value through an interactive/collaborative platform from sales to deployment, and through post-sales. 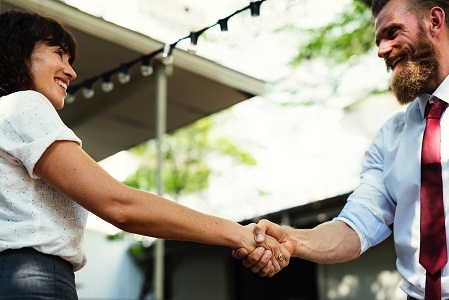 **Research shows that expansion and renewal opportunities come not from “happy customers” but from customers that attain actual business value and measurable outcomes throughout a partnership. For more information on the State of Customer Success from TSIA, check out “The State of Customer Success 2019” by Phil Nanus. Learn more about improving your Customer Success organization in our Voice of Value Podcast here.